How awkward is it when someone's Grammy acceptance speech gets cut off? Pretty bad, especially when it's for a commercial break. So imagine the strange vibes in the air when Drake won the award for the Best Rap Song of the year at the 61st Grammy Awards and he was cut halfway through. His track 'God's Plan' beat tracks by Travis Scott (Sicko Mode), Jay Rock (King's Dead and Win), and Eminem (Lucky You). Noah 40 Shebib, Cardo, Boi1-da, and others to come out on the top. However, someone clearly wasn't too happy about how he celebrated the win. During his acceptance speech, Drake seemed to shade the award show itself saying that it wasn't as important as they thought it was. 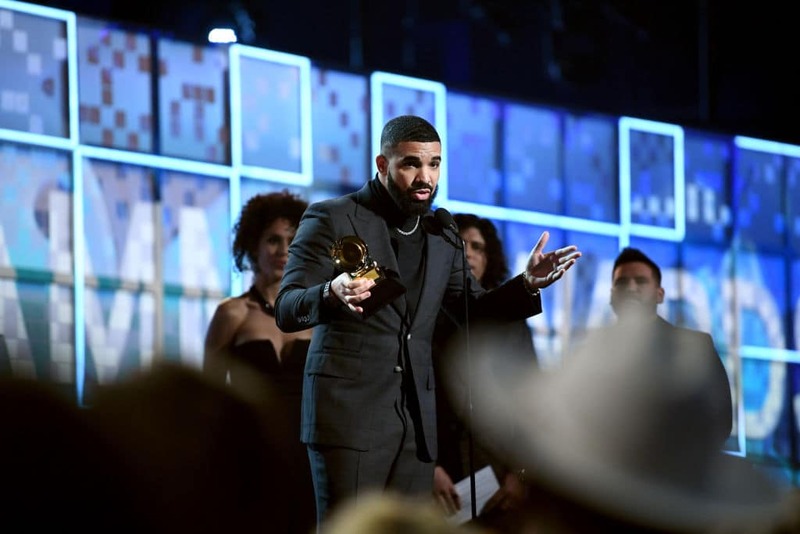 He stepped on to the stage followed by loud cheers from fans and said, "I want to take this opportunity while I'm up here to just talk to all the kids that are watching this, aspiring to do music," Drake said. "All my peers that make music from their heart that do things pure and tell the truth, I wanna let you know we're playing in an opinion-based sport not a factual-based sport. So it's not the NBA where at the end of the year you're holding a trophy because you made the right decisions or won the games." "This is a business where sometimes it's up to a bunch of people who might not understand what a mixed-race kid from Canada has to say or a fly Spanish girl from New York or anybody else, or a brother from Houston right there, my brother Travis [Scott]. But my point is you've already won if you have people singing your songs word for word, if you're a hero in your hometown. Look, if there's people who have regular jobs who are coming out in the rain, in the snow, spending their hard earned money to buy tickets to come to your shows, you don't need this right here. I promise you, you already won." However, Drake’s microphone got muted and his speech cut for a commercial break in the telecast. Strange, isn't it? Drake, who hadn't come to the award show since 2013, made a last-minute appearance this year. Drake now has two Grammy Awards for Best Rap Song. The first one was Hotline Bling that he won all the way back in 2017. This year. Drake had five nominations - Record of the Year, Album of the Year, Song of the Year, and Best Rap Performance (twice). Earlier, he was offered to perform at this year's Grammys but he turned the offer down.